MADRID (AP) — Barcelona held on to a 2-2 draw at Celta Vigo in the Spanish league on Tuesday despite resting its regular starters and finishing the match with 10 men. 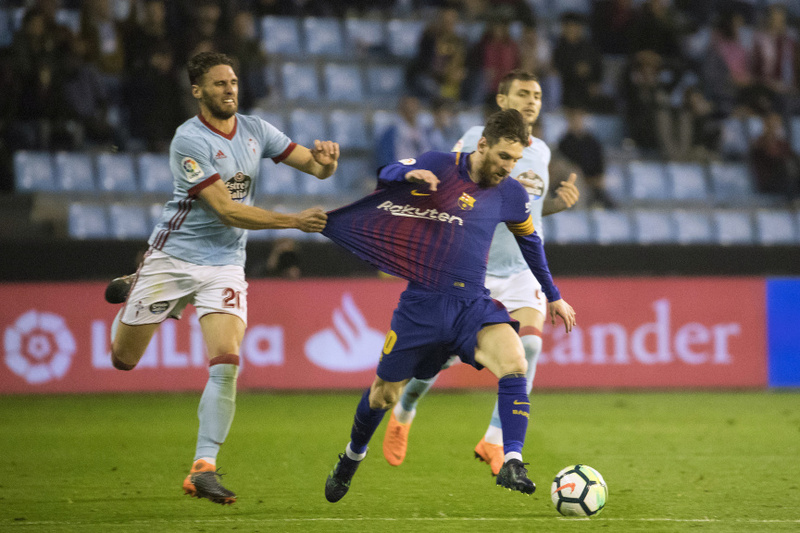 Lionel Messi came off the bench in the second half to give the league leaders a boost but Sergi Roberto was sent off about 10 minutes later to allow Celta to equalize and nearly pull off the victory. The result took Barcelona's unbeaten streak to 40 straight league games, extending the record it had broken last weekend against Valencia. It became the first team to stay unbeaten in 33 consecutive league games in the same season. It also left Barcelona 12 points in front of second-place Atletico Madrid, which visits mid-table Real Sociedad on Thursday. The Catalan club has a chance of clinching the title this weekend, depending on other results. "We stayed back for too long and they pressured us," Barcelona coach Ernesto Valverde said. "In the end it was more or less a fair result because both teams created chances." Among the other regular starters who didn't play on Tuesday were Andres Iniesta, Sergio Busquets, Gerard Pique, Samuel Umtiti and Luis Suarez. Barcelona plays the Copa del Rey final against Sevilla on Saturday in Madrid. "We had to take some risks with the changes considering that we have a final to play in our next match," Valverde said. Celta twice came from behind, with Iago Aspas scoring the equalizer in the 82nd minute after the ball apparently hit his hand before going in. Barcelona opened the scoring when Ousmane Dembele netted his first La Liga goal with a neat shot from just inside the area in the 36th. Jonathan "Jonny" Castro equalized for the hosts just before halftime, and Paco Alcacer put the Catalan club ahead again from close range a few minutes after Messi entered the match in the 60th. But Celta took control after Roberto was sent off in the 71st with a straight red card for pulling Aspas from behind to prevent a one-on-one situation for the hosts. Aspas eventually got the equalizer after Marc-Andre ter Stegen tried to parry a ball crossed into the area but it ricocheted off the striker's body, including his left arm. Celta stayed ninth in the standings with the result. Deportivo La Coruna and Sevilla drew 0-0, a result that didn't help either club. Deportivo remained in 18th place with the home draw, four points inside the relegation zone, while Sevilla stayed seventh, barely holding on to the final qualification spot for the Europa League. Clarence Seedorf's Deportivo was trying to win its third match in a row after a run of 15 winless games. Sevilla, which played with several second-stringers ahead of the Copa del Rey final, hasn't won in seven straight matches in all competitions. Villarreal ended a three-game winless streak by defeating Leganes 2-1 and opening a three-point gap to seventh-place Sevilla. Victor Ruiz put the hosts ahead before halftime and Carlos Bacca added to the lead early in the second half, while Darko Brasanac pulled one back for 14th-place Leganes near the end of the match at Ceramica Stadium.